We’re delivering picture perfect smiles to patients all around LaSalle, Illinois with natural looking dental veneers. You should be proud of your smile, but imperfections in your teeth can cause embarrassment. We can help improve your smile using thin pieces of porcelain called veneers that not only create a natural look for your teeth, but also help strengthen and protect. If you need position alteration or need to change tooth shape or color, then porcelain veneers may be the right choice for you. The photo you see here is of an actual porcelain veneers patient from A Lifetime of Smiles. Porcelain veneers replace tooth enamel and help restore tooth function and have an appearance better than the original tooth. The key to veneer placement is the bond between the tooth and the veneer. We use a light sensitive adhesive that hardens when exposed to a specific type of light. It’s an excellent option for broken or fractured teeth, discolored teeth or teeth with irregular shapes or contours. You can also use them to fill gaps between teeth and for some bite related issues. Each veneer is sculpted for each tooth and blended to be indistinguishable from regular teeth. They’re resistant to stains like coffee and tea and the majority of your teeth remain intact unlike crowns or other dental procedures. You may have some heat and cold sensitivity after attaching the veneers, but that should disappear within a few days. 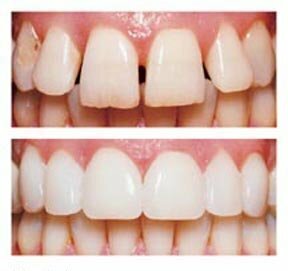 The veneers can be used just like normal teeth and can be maintained with regular brushing using non-abrasive toothpaste. You should also avoid grinding your teeth, biting your nails, etc. just as you would your normal teeth. If you think porcelain veneers might be a good option for you, then contact A Lifetime of Smiles today in LaSalle or Princeton, Illinois. You’ll be greeted on the phone by our friendly staff who can help get you started. We’ll schedule a date and time that works best for your busy schedule. Then you’ll meet with our A Lifetime of Smiles team who will examine your smile and determine which porcelain veneers will naturally match your unique smile. Contact us today and let’s get your smile picture perfect!